It doesn't appear that this scanner will actually have trunking on it, the manual didn't specify, but if this scanner is like the BR330T, it might have trunking. It does have the Signal Stalker feature however. Next is a GRE scanner, it's Triple Trunking Mobile/Base scanner. And looks like a "scaled-down" version of the Pro-2096 without Digital Trunking. This one is only known as 0705. As a special bonus here's a picture from the new GRE 0715 or PSR-500/600. Which was FCC approved early August 2008. Radioshack currently only carries GRE or Uniden Scanners. GRE scanners and are branded as RadioShack. 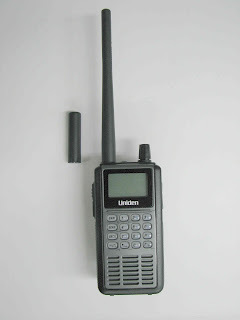 While the racing scanner might be a RadioShack model, the 0705 will not be. It is the GRECOM PSR-400 which will not be sold at RS. Odd, it says RadioShack right on it, maybe the manual is from the 0705. It was probably in the cabinet used when the scanner was offered to RS. But, RS must have turned down the offer, because it will definitely not be RS branded or available through RS corporate stores (maybe some RS dealers will sell it, but not the corporate). Cool, I would love to see some more NON-RS branded scanners out there.